Includes 27.2 mm seat post and shim, and high quality headset. Supplied with expedition quality steel fork with carrier, mudguard, dynamo and lamp bosses. This frame is suitable for suspension forks from 80 mm - 120 mm travel routing for EX version of the Rohloff hub, stainless guides and bosses, M6 stainless carrier bosses on front fork, stainless seat clamp. ISO rear disc mount. Seat tube is 31.8 mm, Top tube is 31.8 mm, Down tube is 34.9 mm, 19 mm stays. Although the geometries of the sizes 620M and 620L are suspension compatible, because of the length of their head tubes, there's no suspension fork (that we're aware of) with a steerer sufficiently long enough to be useable with these particular two frame sizes. INCLUDES:, 1 1/8 (28.6mm) Orbit XL2 threadless headset, 27.2mm alloy micro adjust seat post, alloy eccentric and eccentric screws. Does not include: fixing screws, bottom bracket or adaptors (SJSC part 11703) to change 2 x M5 bosses on rear dropout to 1 x M6 boss. Will this frame still include the third bottle cage screws at the base of the frame due to the S&S Coupler being located in this area? Does This Include An S+S Coupling Spanner? An S&S spanner will indeed be included with this frame. Can you please tell me the weight of the Nomad S&S 620L frame and fork? Also what is the shipping cost to the west coast of the USA, Seattle, WA 98101? 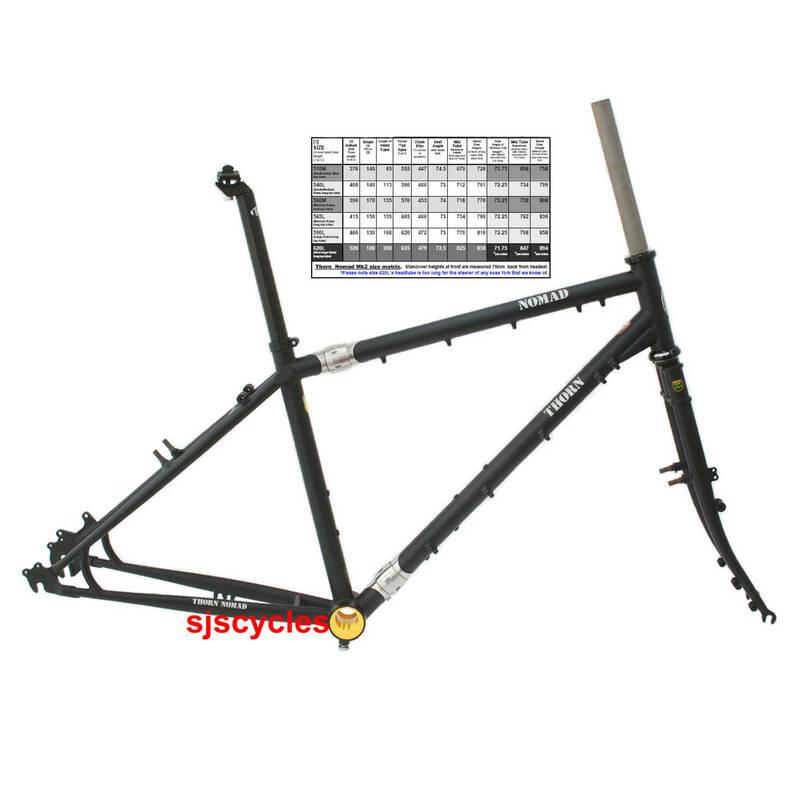 What is the cost of the frame and fork in US dollars? What is the steerer length on the fork? I assume the fork length is 430 dropout center to headset seat? What is the head tube and seat tube angles? I am 6'5.5" tall.